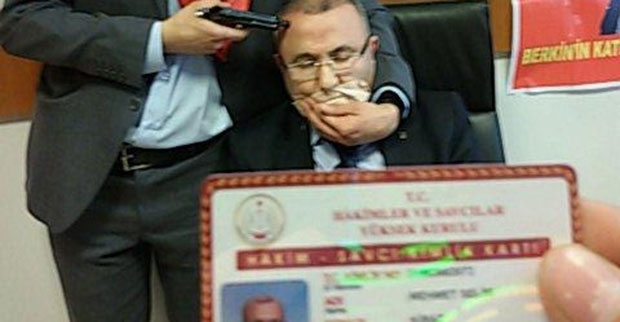 On March 31st, 2015 at around 12 o’clock, two militants of DHKC (Revolutionary People’s Liberation Front) raided the Caglayan Courthouse in Istanbul and took hostage Mehmet Selim Kiraz, a public prosecutor of Berkin Elvan file. Berkin Elvan, who was shot by still unknown policemen during the June Uprising of 2013, had been murdered after staying in coma for almost one year. None of his murderes were revelead so far, however, despite all the attempts and demands from the family and popular democratic organizations. Below there is an interview conducted by Ahmet Şık, a journalist for Cumhuriyet newspaper with the militants at around 16 o’clock, 3-4 hours ago before they were summarily executed by the SWAT teams. A twitter hashtag #BizDeSiziSeviyoruz (We love you too) became a Trending Topic in Twitter after the last Twitter post of the militants saying “Our people, we love you”. Are you going to end your action? Can you tell me about the ongoing negotiations? Through our Twitter account, we have posted the registration numbers of the policemen who came forward in the investigation file. According to the file, the Criminal Bureau of Security identified this three policemen among the 21 suspects. We have learned that these three police officers might be the ones who shot Berkin. The prosecutor already gave us this information. In the negotiations, we demand that the identities of these three police officers are disclosed on a live TV broadcast. The members of the negotiating delegation told us that it is 99% that Berkin was murdered by these policemen. Therefore we demand the disclosure of their names on a live TV broadcast. We examined the files here. We looked at the photographs of the suspected policemen. The photos of these three police men were framed in red according to the report by the Criminal Bureau. One has the initials G.T. with the serial number 35… We have also shared the registration numbers of the other policemen and we demand the disclosure of their names. Do you think that your demand will be met? The names of the perpetrators were known so far but were not disclosed. They will announce and will bring to the court after our attempt. The names of the murderers in Ali Ismail Korkmaz and Ethem Sarısülük cases were also known. But you see the results of the trials. Murderers are never given the necessary the punishment. That’s why we demand the murderers should stand trial in front of a popular court. And this is our second demand. Wounded workers are rescued as Minister of Energy and other authorities honoured them with their presence. A mine explosion has just claimed the lives, as of the latest count, of almost 300 workers in Turkey. This event added another link to the long chain of massacres that has taken place during the rule of the Adalet ve Kalkınma Partisi (Justice and Development Party, AKP) government. Leaving hundreds of workers dead and injured, the massacre has brought grief to the rest of the population, whose sharp anger was already directed toward the government. The explosion took place in a mining site located in Soma town of Manisa, a city in western Turkey. Formerly a national, state-owned property, the mines were privatized in 2005 by the DG of Turkish Coal, with the operating rights of the mines transferred into a company called Soma Coal. 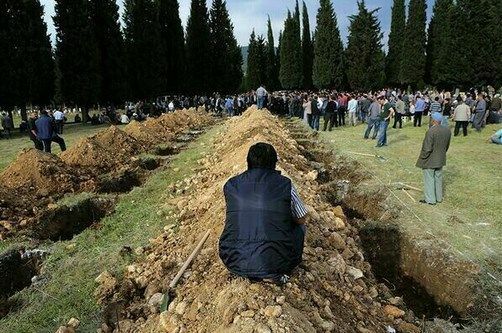 Hundreds of graves are dug in Soma for the miners. Capitalism killed hundreds of workers in the mines of Soma. The number of the dead bodies recovered from the dark tunnels reached up to 282. In England, 204 miners died after a landslide in 1862, 361 miners died in 1866 and 290 miners died after an explosion in 1894,” Erdogan said. “The most deadly mine accident occurred in France in 1906 where 1,099 miners died. More recently, 687 miners died in Japan in 1914. In China, 1,549 miners died after a mixture of gas and coal poisoned them in 1942. Again in China, 684 miners died in 1960. 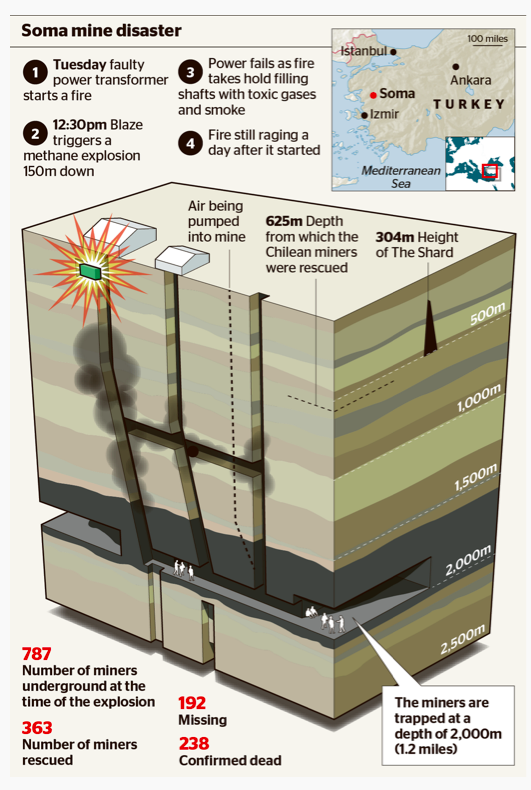 And a mine gas explosion resulted in the death of 458 miners in Japan in 1963. … In the United States, too, which has the most advanced technology, 361 miners died in 1907… There is something called work accident in the literature.